Once you start hanging out with people who cook, it won't be long before someone points out that grilling and barbecuing aren't the same thing. This situation can occur when people from different parts of the country get together, since the terms have different meanings in different regions. When that happens, it's only a matter of time before someone tries to explain how smoking is different from barbecuing. The next thing you know, instead of cooking, everyone's arguing, and you're all going hungry. To help you avoid this problem in the future, let's look at the three methods and discuss their basic procedures as well as some of the tools you'll need for each method. In a nutshell, grilling means cooking over fire, hot and fast. Barbecue means low and slow, and smoking means cooking something with smoke (also low and slow). The latter two also refer to cooking meat, fish, and poultry specifically, whereas grilling can include vegetables, fruits, and other foods you might not have considered. Smoking and barbecuing, however, are all about the meat. It's the low temperatures and long cooking times that help big, tough cuts of meat turn meltingly tender, and express their full flavors. What all three methods have in common, of course, is that they are all done outside, and you can use the same piece of equipment for each one. That equipment, of course, is your grill. It doesn't matter whether you use gas or charcoal — you can grill, barbecue, and smoke with both. You can also purchase a dedicated smoker if you want to get into smoking big time or take on a large-scale project, but your grill will absolutely work. Grilling is all about cooking food quickly over a hot fire (fueled by charcoal or gas). Hot and fast in the context of grilling means cooking at a temperature of 350 F or above, for less than an hour. For items like steaks and chops, temperatures should approach 450 to 500 F to allow for short cooking times. Remember, the best meats for grilling are the tenderest cuts, like ribeye steaks, strip steaks, T-bones and others from the rib and short loin primal cuts. Cooking them quickly is the best way to preserve that tenderness, and prevent overcooking and drying out. Over hot fire for a short time is the best way to cook a juicy, flavorful piece of meat. There's not a lot of finesse involved in grilling steaks, but that's not the case with fish, vegetables, or poultry. For more delicate foods, it's often better to shoot for a lower temperature, and that's where the extra skill comes in: building a two-zone fire. More on that here. If grilling is about cooking small cuts of meat quickly, barbecue is where we get into large cuts of meat. We're talking whole pork shoulders, beef briskets, rib roasts, slabs of ribs, even a whole turkey. To cook these big cuts on a grill, the temperature needs to be very low: between 190 and 300 F, though you'll probably see recipes calling for a temperature between 225 to 250 F. With temperatures that low, cooking a big piece of meat will take several hours. The big trick is maintaining that temperature for the duration of the cooking. On a gas grill, that's essentially a matter of turning the knob to low heat and leaving it there. With a charcoal grill, however, you'll have to add fresh coals every hour or so. A standard grill will have a pair of little doors in the grate to facilitate this. 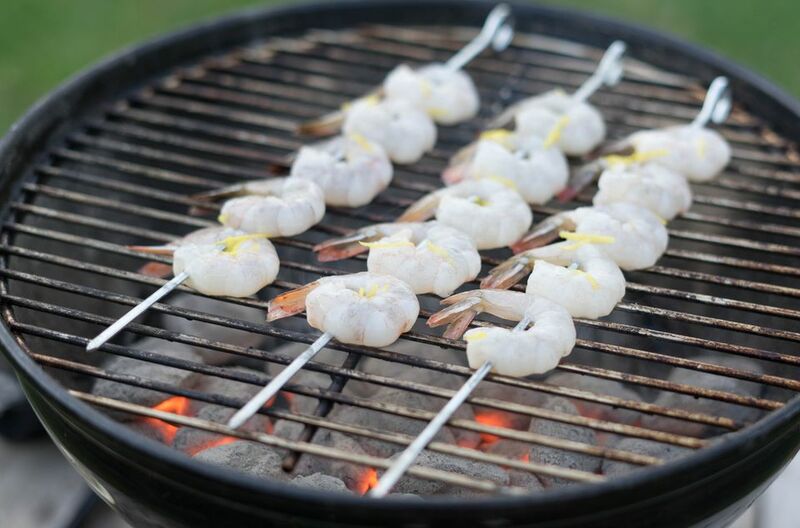 A set of charcoal baskets is also useful, because it helps to keep a pan of water in the center of the grill. Baskets help make room on the surface, in addition to keeping coals off to the side. This helps heat the food indirectly, and more slowly — which is the goal. Since traditional barbecue also needs a little smoke, you'll need to include wood chips (or chunks), and replenish them during cooking as well. Smoking is like the extreme version of barbecuing: you're actually cooking the food with smoke from smoldering chunks or chips of hickory, mesquite, apple or cherry, each of which contribute their own flavor to the meat. Smoking occurs at an even lower temperature than barbecue, to ensure the smoky flavor infuses the meat as well as cooking it all the way through. You'll want your grill to be between 125 and 175 F to smoke food; any hotter and the outer parts of the meat will cook too soon, forming a barrier the smoke can't cross. Cooking at this temperature means that cooking times of 24 hours are not unusual. Of the three methods, smoking is the one that requires the most expertise. But if you start with simple grilling and work your way to more complex large-scale barbecue, you may eventually want to try your hand at smoking. Here's a good place to start.